A drone controlled by a pilot's brain flies during USF's first ever Brain-Drone Races. WUSF University Beat report on the first ever USF Brain-Drone Races. Pilots put on an electroencephalography (EEG) headband – it looks almost like three-quarters of a plastic crown, with small sensors that lightly make contact with seven points around the forehead, ears and back of the skull. The headband is actually a brain-computer interface (BCI) that creates a pathway for EEG signals between the pilot's brain, the drone, and the computer program running in front of the pilot. “We take those signals, translate it through an application that we have, and then do a message that the drone can actually understand. So that message was sent to the drone, which decides it will start moving,” said Marvin Andujar, a USF assistant professor of Computer Science and Engineering who created the first Brain-Drone race ever when he was at the University of Florida. As there are only two commands – neutral and push – pilots first think of nothing, creating the neutral EEG signal. Then they stare at a box on the computer screen and think of moving that box to create the push command. The neat thing, Andujar said, is that while every pilot’s thought may be different, the drone is just looking for the signal. As for the competition, more than 300 hundred people packed the Corral, a small gymnasium next to the USF Yuengling Center, on a Saturday morning to watch students from eight countries, including the U.S., India, Japan and Brazil, do battle. The students, who qualified on times posted in individual tryouts, first took part in one-on-one drag races, trying to get their drone about halfway across a basketball court before their opponent. Senior computer engineering major Emily Cardella got off to a slow start, but managed to overcome all the clamor in the room to win her first round match. "When I first started my race, my drone was just hovering, it wasn't really moving forward. And that's because I was mostly distracted by all the outside noise but once I got myself in the zone, I was able to push it forward. So yeah, a lot of concentration is involved,” she said. “My thought is pushing a sled on a basketball court, kind of like doing sprints. So it's really kind of athletic as well – athletic in your mind,” added Cardella. And since a lot of young girls were at the races, Cardella liked that she might inspire them to study engineering and technology like she does. "Engineering was always something that I knew that I wanted to do. So I hope that by being here, I can inspire some of the younger generation,” she said. The winner of the competition ended up being computer science and engineering graduate student Khaled Alshatti of Kuwait, who won a trophy, a drone and the right to represent USF in the developing “Brain Drone Racing League.” So far, UF, USF and the University of Alabama have held qualifying events. “It's actually a lot of pressure competing here and now that knowing that I might be coming for more of these (competitions), that just adds more pressure, but it's a wonderful experience and I'm glad I came here,” said Alshatti. 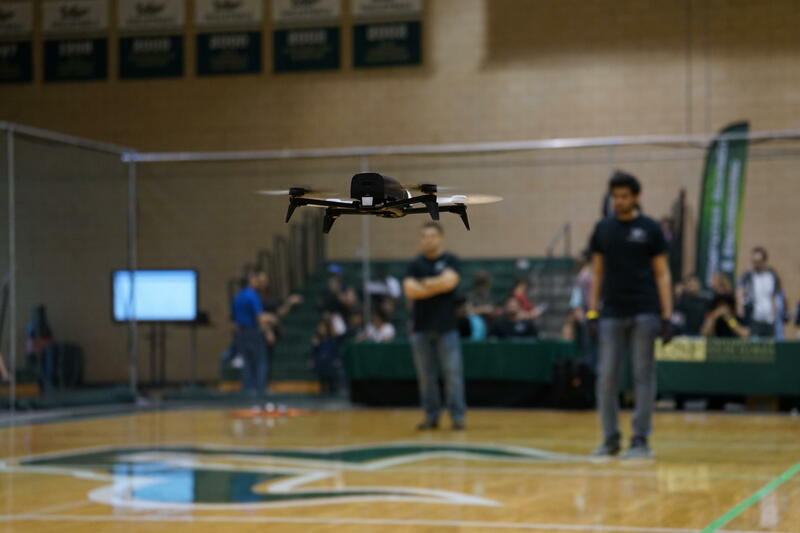 Sixteen students representing 8 countries recently battled in the first @USouthFlorida Brain-Drone race. As for why he won, Alshatti had a few thoughts – first, he completely ignored his opponents. “I tried (looking at his opponent), and it distracted me way more than it should have. So I stopped focusing on that one 100 percent, and that's what worked,” he said. Second, he relied on some inspiration from one of the most powerful minds in comic books. "I guess (I was) kind of like Professor Xavier from X-Men: squint your eyes, bite on your teeth, focus as much as you can. And that's what worked for me the most to be honest,” he said. That superhero idea even extended to some of the younger children who got to try out the drones after the competition. But there's more that this brain-computer interface can do than just race. Imagine, Andujar said, about what this technology might mean for a physically disabled person. “Say somebody's in a wheelchair and wearing a brain device, you can think of opening a closed door and it would be easier for them to do things around the house,” he said, adding that, as the technology continues developing, we’ll only be limited – like a drone pilot – by our imaginations.